Diversification, what are you trying to accomplish? I visited several mutual fund companies’ booths at The Money Show. Each company urged us to take our entire nest egg and invest it in their family of funds. By doing so, “We would be well diversified and safe.” Sorry, not diversified enough to suit my comfort level! While a fire is unlikely to happen, prudent homeowners buy insurance. Insurance does not alter the risk of a fire; it protects the homeowner from suffering catastrophic economic losses. Losing a major portion of your life savings would be catastrophic. Some friends saw their 401(k) drop 40%+ in the last crash – and still have not recovered. Diversification is allocating your assets to reduce the risk of losing everything. Like a fire sprinkler system, you may have some damage but you are better protected against a catastrophic loss. Your life savings are subject to many risks. Some have a higher probability of happening, and the degree of potential damage varies. Let’s look at some risks individually. Government or country risk – Today’s politicos are fighting for power, ignoring the issues of spending cuts, tax reform, unsustainable debt and spending promises that are impossible to keep. As the bills come due, things will get ugly. Savers and their money will be targeted – it’s a given! “It was almost exactly one year ago to the day that an entire nation was frozen out of its savings… overnight. Cypriots went to bed on Friday thinking everything was fine. By the next morning, they had no way to pay their bills or buy food. This photo of a sobbing Greek pensioner circled the globe. Reuters reports: “EU explores account freezes to prevent runs at failing banks.” Remember: failing governments and failing banks are joined at the hip. How do savers hedge the risk of government confiscation? Hold some of your assets outside the country. It’s legal as long as you follow proper reporting requirements. 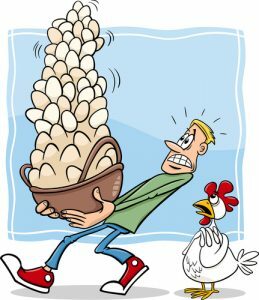 Whether it’s Switzerland, the Cook Islands or Canada, moving some eggs to another location provides additional protection. Do you believe the US won’t resort to extreme measures when the bills come due? Neither do I! The risk of holding assets inside any single country is huge when compared to geographical asset diversification. Better safe than sorry! Inflation or currency risk – Inflation is a common tool for desperate governments woefully in debt. The Fed’s printing press created trillions of dollars for bank bailouts and government debt. Unfunded liabilities are now approaching $900,000 per taxpayer. It’s IMPOSSIBLE for the government to keep those promises. If printing money to pay government promises worked, Venezuela would be the richest country in the world. Instead they are starving. If you reach age 65, on average, you can expect to live another 20 years. The Inflation Calculator concludes it takes $1,528 today to buy what $1,000 did 20 years ago. That’s tame when compared to what may be coming. How does an investor hedge against inflation? Hold money in different currencies – outside the country if possible. The Greeks who proactively moved their money into Euros (held outside the country) limited their damage. Gold is the most common recommendation. During times of high inflation, it could easily appreciate ahead of the inflation rate. Own metal (not paper gold) and don’t store it in a safety deposit box. Will a government agent be standing next to you when you open your box? Invest in assets that historically appreciate quickly along with inflation. Productive farmland, prime real estate, and certain collectibles are good examples. Schwab offers a Global Trading Account. 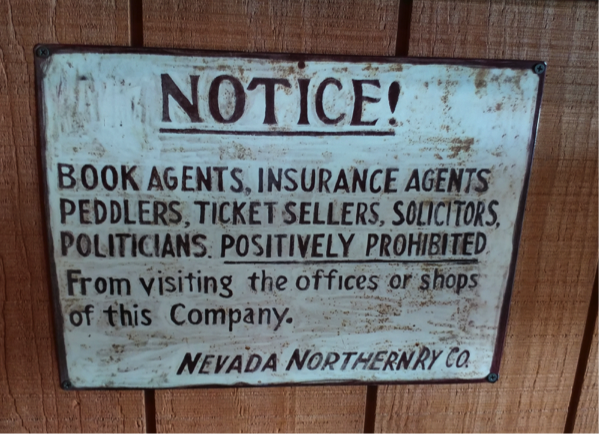 Check with your broker, they may have ways to make it easier. What’s the probability of runaway inflation occurring in your lifetime? No one knows. The risk of holding your life savings in one single currency is HUGE as compared to diversifying among many. Better safe than sorry! The bond market is shaky. The stock market is breaking records and is due for a collapse. The Fed is hell-bent on raising rates while selling their bond inventory, which adds a double-whammy on rising interest rates. Low interest rates led many corporations to “binge borrow” – buying back their stock while the market breaks new records. Bond defaults are rising. Keep your bond maturities short and top quality. If you are unsure, compare bond rates to short term CDs. Keep your stop losses current. Check the small print for your mutual funds; they might not be as liquid as you think. Sector Risk – The common hedge – own non-correlated assets; (one zigs and the other zags – or does nothing) because different factors cause price movement. Utility stocks, energy stocks, bonds, tech stocks, and metals are good examples. Spread your eggs around wisely. If an investor is totally invested in non-correlated US stocks, are they really safe from a catastrophic loss? When the market crashes, all stocks go down like a falling tide. Mutual funds, insurance companies, computer managed money and individual investors all head for the exits driving stock prices down very quickly. “…Ballooning asset valuations and consumer debt pose even greater risks to the economy than they did back in 2008. …After nine years of this artificial levitation on the part of financial assets, …what we have today is a global financial system that’s just about as leveraged, and in many cases more leveraged, than 2008. …I don’t think the fixes that have been put into place have actually created a sound financial system. What happens if it’s a BIG RUCKUS, and a huge market crash? It took the market over 5 years to recover after the last crash. It took 25 years to recover from the granddaddy of all ruckuses, the 1929 crash. How long can you afford to hold on to your stocks before you must start selling to pay your bills? “Buy and Hold forever” is a great theory. Few people are emotionally able to handle the stress of seeing catastrophic losses of their life savings – particularly if they are no longer working. Investors who think they can time the market and get their stocks sold ahead of the institutional investor and programmed traders are taking a huge, unnecessary risk. Better to limit your exposure, deal in non-correlated holdings and keep your stop losses current. The good old days are gone – deal with it! Remember the days when retirees put the majority of their life savings in top quality bonds and CD’s earning 6% with nary a worry? Remember 2008 when the first bailout bill was passed and the government told us it was a one-time event – we would soon be back to normal? The broken government promises are just a memory. The lesson is a simple one. Bad things happen. Learn from the experience and insure that, should it happen again, you can minimize the damage. High inflation, government policies, bond or stock market crashes – all have the potential for catastrophic – life changing losses! No one can guarantee these events will not happen – don’t ignore the possibility. It’s not a matter of “if”; but rather “when” the next ruckus will happen. Investors with a well-diversified portfolio (similar to a fire sprinkler system) may suffer some damage, but they’re much better protected against a catastrophic loss. 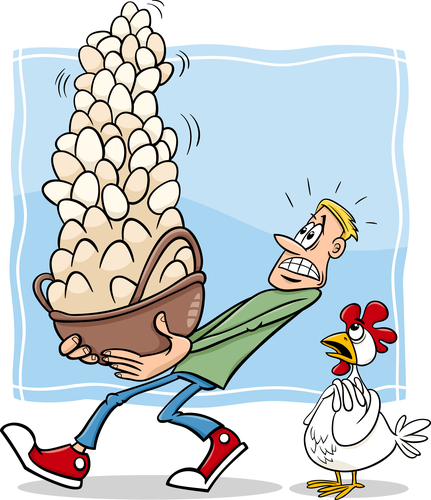 When you compare the two risks – a life changing, catastrophic loss, versus the risk of diversifying your assets prudently – diversification becomes a no-brainer! Deploy your assets wisely and stay vigilant! I’ve had several nice notes from readers (not wanting to miss a single article) indicating they have a new email address and want us to change our records. At the bottom of every email look for either the sentence that says: If you need to update your subscriber information, CLICK HERE …or… at the very bottom there is a link: Update Subscription Preferences. You can click on either of those links and make the necessary changes. 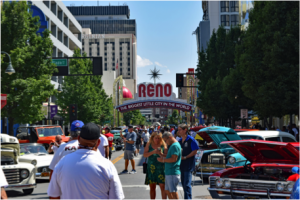 Last week Jo and I drove to Reno, NV for “Hot August Nights” which is a fun multi-day car show. There are thousands of cool cars. Several streets are blocked off in the downtown area. 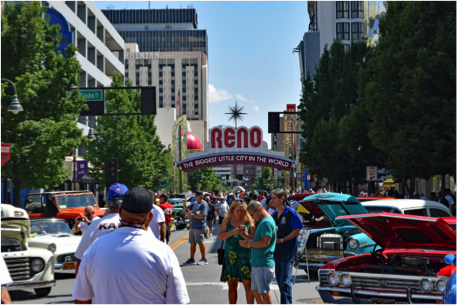 Each evening they promenade through downtown Reno and it takes about three hours. If you are a car buff, this is as close to nirvana as I have seen. We saw hundreds of vintage cars in pristine condition. We stayed in Stateline, NV by Lake Tahoe. The first night our power went out for four hours. It was very dark in the huge pine forest until around 10:00 PM when a full moon rose above the pine tops – it was really neat. We welcomed the 40 degree evening temperatures – certainly a nice change from the heat of the Phoenix summer. 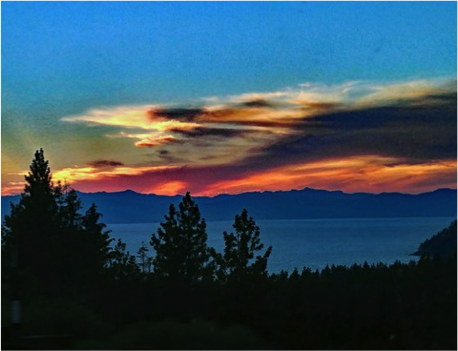 Jo took this photo of Lake Tahoe on her phone out the car window late one evening. 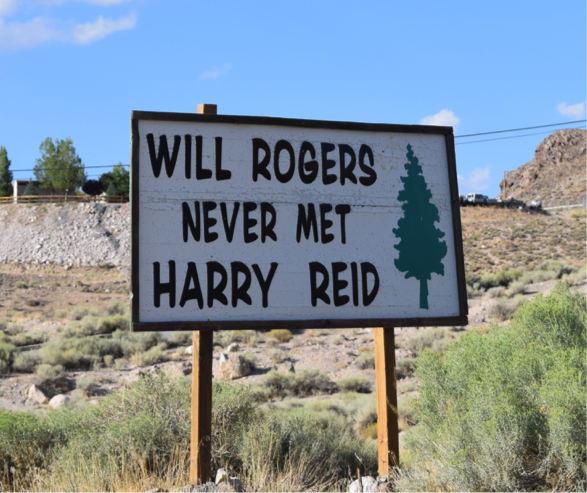 This week’s humor is brought to you by the citizens of Tonopah, NV.